The tents for storing disaster relief goods have been erected. Today (4/8), on the parking lot of the JAG Central Bible Colleg, Superintendent Hosoi, Pastor Katsuhiro Honda, and a number of Bible college students put up the tents that will be used to store relief goods. And so now we need volunteers to sort relief goods. At the moment, we are making an open call for volunteers to came and work along side the Bible college students, sorting relief items at the disaster response office. Time: Every week Monday～Friday 10:00AM～5:00PM＊Please inform us what time fits your schedule. Please contact Ken Kubota at the disaster volunteer information desk. Not only did the Tohoku earthquake that occurred on March 11th destroy many precious lives, it also left deep emotional damage (trauma) on the survivors. In the case of disaster induced trauma, it is known that the earlier care is received the traumatic effects will be reduced. The seminar will be lead by the husband and wife team of Nathan and Beth Davis who have global influence regarding this issue and have trained care givers in the aftermath of numerous wars and disasters. Not merely will you study the physiological angle but also this seminar will teach you the Biblical angle, being encouraged by this spiritual blessing. It will be a full schedule packed with lots of content so please attend if possible. Interpretation of the lectures and the translations of the materials will be handled by Pastor Hiroshi Horikawa. We are taking advantage of this seminar as a replacement for the annual CBC beginning of the term lecture series. Rev. Nathan Davis:　The eldest son of US Assemblies of God missionaries Dr. and Mrs. Jim Davis, born and raised in Kobe, Japan. He served for 29 years in the Unite States Air Force as a physiologist. He leads practical training seminars on issues such as interpersonal relationships, crisis intervention, spiritual development, and stress management. On top of that he gives one on one counseling to over 150 missionaries a year. Nathan has a been recognized as a counselor by the International Critical Incident Stress Foundation（ICISF). Dr. Beth Davis:　She has worked as a missionary for over 25 years in Vietnam, the Philippines, Hong Kong and Belgium. She now serves as director of Caring Connection, an arm of the US Assemblies of God which provides emotional care to missionaries around the world. Like her husband she is also recognized by and is a member of ICISF. Dr. Hiroshi Horikawa：　Pastor Horikawa, who will oversee the interpretation of this seminar, is certified as a clinical psychologist studying at Hiroshima University School of Engineering, graduating from Central Bible College of Japan, studying at Vanguard University Graduate School, receiving a master’s degree from Fuller Theological Seminary and completing a doctorate (in clinical psychology) at Yasuda Lady’s University. He is currently the pastor Mitaki Green Chapel (Hiroshima Christ Church) as well as contributing to the community as a chaplain and school counselor. For those who would like to attend, please FAX or email your name, telephone number, email address, your affiliated church and position (pastor, believer, Bible school student, etc.). Last night the shaking was rather intense. Even after the quaking died down my legs were still trembling as I had memories of March 11th. After the quaking stopped we contacted church members in Koriyama, Sendai and Ishimaki and confirmed that everyone was fine. Today is the opening ceremony for my daughter’s high school. We woke up at 5:30AM, checked the train lines and found that they were not running, so we prepared a sack lunch and got ready to go by car. She enjoys having a day off but she seemed sad to not be able to get back to school. She seems to be appreciating the blessing of attending school. Previously at 7:30AM. Pastor K from the Tokyo area sent a large number of school backpacks for the evacuee children that have been moved into the Nagamori Elementary School near our church. Oddly enough, yesterday a flyer came to the house reading “To All Parents of Nagamori Elementary School Students”. Last month my son graduated out of Nagamori Elementary and to I thought it strange that they still sent me a flyer… maybe it was God? This morning at 9:00 I am planning on delivering the backpacks and some other school goods. It is a small elementary school with about 190 students, 68 of whom have just transferred in as evacuees. I am so thankful that God will continue to give us opportunities to interact with others. Last night’s quaking was intense but only strong enough to topple small things, so we were protected. We lost power and water but as of this morning the water is back. We are still without power. Because of last month’s earthquake everyone was rather frightened. There is no power. Water and propane gas is fine. Yamagata city is entirely without power, traffic signals and trains are not working. It is projected to take a few hours to have power restored. Currently, there is no power or water. Pastor Ito’s cell phone is also not able to receive service. Please pray for that the volunteers that were on their way to Izumi would arrive safely.⇒Thank God, the volunteers arrived safely. This earthquake had strong lateral shaking. Since this earthquake was shorter that then last month’s earthquake the only effects were that a few things fell off of the bookcase. Thankfully the church is fine. The shaking was rather strong but the only effects were that some books and dishes fell off of their shelves. There are no injuries. A bookshelf and dresser fell over and it seems that some cracks from last month’s quake have widened slightly. We have not lost any utilities. There seem to be no problems. In fact this morning was the first that the water has worked since last month’s earthquake. No problems to report. Because of the earthquake it has not been possible to do snow removal from the roof and so roof tiles and a few window panes have broken and will need to be repaired. I give thanks to God for protecting us and keeping us safe, and I also thank all of you for your continual prayers. Last week, Mr. S, the owner of the hair salon I go to contacted me, and said, "Mrs. Sanga, I knew you were up to something! Is there anything I can do to help?" So, I talked to Mr. H, a city officer who is in charge of relief supplies at "Pick Palette Fukushima" where I've been volunteering to help with their kids program. He gave us permission to set up a tent for a haircut service, and so we gave people free haircuts on Tuesday the 5th. About 105 people requested haircuts. Mr. S and another stylist (an owner of another beauty salon) came even though it was their off-day, and they started giving haircut at 8:30 am. The tent was facing north, away from the sun and it was very cold in there, but once we started, people (evacuees) kept coming in. 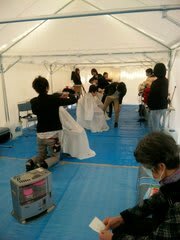 A little after 10 am, three more volunteer hairstylists from Yokohama showed up, so we had five stylist working for free. The five stylists kept on working until 4 pm, and 79 people were able to get their haircut that day. In the afternoon, an elderly lady was brought in a wheelchair. I went to her and said, “You are going to be pretty! It feels good, doesn’t it?” and she became teary eyed. A high school girl R (a church member), Y (a volunteer) and I worked as receptionists and assistants. We also babysat for moms who were getting their haircut, and played with the children who were waiting their turn. Some other ways we ministered to everyone was to play worship songs such as Hillsong all day long in the tent, as well as praying. Little by little, we are moving forward. We will do this again with Mr. S next Tuesday. Praise the Lord. Thank you for your prayers. In the afternoon of the March 3rd, we visited a shelter where evacuees from Kawamata-cho, Date-gun were staying and had a church service there. After the service, while we were having conversation, one lady came up to me and said with a grievous look, "My watch completely stopped on March 11th." We had no word to say to her. All we could do was to lay our hands on her and cried with her and prayed for her. Nevertheless, she told us at the end, "I am from Buddhist family and my father is a priest, but I would like to start going to church and read the Bible." 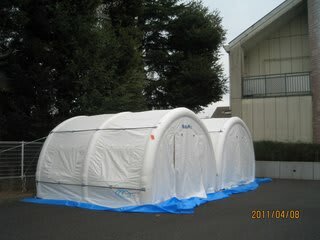 I am assuming that we will have a water baptism for the man in his 50's who has made the decision (he is a worker of Fukushima Daiichi reactor) next time we see him, though I don't when and where it's going to be... All I can say is that it wouldn't be the same shelter, because they are going to move again for the 5th time. It is so easy to be overwhelmed in the face of this catastrophic reality and lose sight of what we should do, what we can do. Nevertheless, I can't help but worship the Lord because I am daily experiencing God's marvelous work and presence in the midst of the pain and sufferings of this massive disaster, tsunami, and radiation threat. I am hoping to collaborate with other local churches in Fukushima, and reach out to people who have become evacuees due to the plant accidents and bring them the light and hope of the Gospel and the love of God. Again, thank you so much for your continual prayers. We really need them. We are always thankful for your prayers. As soon as we can, we hope to baptize the middle aged man (who is a Tepco employee at the Fukushima nuclear power plant.) that declared before everyone that he wanted to receive baptism (It is unclear when we will see him next, probably not at that shelter since he is about to be moved for the 5th time.). Faced with the reality of this disaster, we are often unsure how we should proceed or what we should be doing at the moment. But I praise the Lord because each day we experience the awesome works of God amid the suffering cause by the earthquake, tsunami, and nuclear accident. We hope to continue partnering with all the churches in Fukushima to bring the Light of the Gospel, hope and the Love of God to all of those affected by the nuclear accident. We still need everyone’s continued prayers. Our deepest thanks to every pastor and believer in Japan that has offered up precious prayers. We are currently praying and asking what we should do next. Yesterday the church held a “Coaching Mama Special” meeting. This is a seminar that we started 2 years ago which invites local non-Christian mothers to meet once every two months for a “child rearing seminar”. At 2PM we had 10 mothers and 20 children gather. Starting from March 11 I and some of the high school students from Koriyama Christ Church volunteer 3, 4 times a week at the “kids class”. We prepared games as well as reading picture books, one of our members made a “fish pond” game that went over really well. The children’s laughter and cheers filled the sanctuary. In another room, an employee from our local cake shop, which just recently reopened, treated all of the moms to a Springy strawberry topped cake. -When the shaking stopped how were you, your children, your family? -Some people evacuated out of the prefecture, how everyday life has become difficult in Koriyama, feeling guilty and crying everyday. -Always frustrated and the endless tears. -Fears over our children’s future and health, and worries whether it is safe to raise children in this town. -Hearing angering and deplorable things on the radio like the person on the Tokyo Yamanote line train who said, “Anybody who evacuates here from Fukushima prefecture should hang a sign around their neck that reads ‘Fukushiman’”. These moms are afraid that because the nuclear accident has affected the people of Fukushima that their children will be discriminated against. Everyone shared their fears with tears streaming down; some merely cried and could not even speak being comforted by the others around them. -First, we and our families are disaster victims. -Going forward we will continue to have chances to meet and interact with other disaster victims. -Fear and anxiety is normal. -What are the specific needs of children and the elderly etc. Everyone shared and listened so intently that they did not even touch their cake or tea. I shared, “I like this town, and Fukushima! Most likely there will continue to be heartless and painful things said and people with discriminating attitudes that spread troubling information. I choose to be proactive! The Bible says that God gives us the strength to overcome adversity. One mom said, “I too was encouraged by Toyomi, who is not from Fukushima, and by her church members, and now I am not afraid of anything!” Everyone had a laugh. With that, we all dived into the strawberry cake, “Wow, deeelish! It’s almost too good to eat!”… Then more tears. We ended the time by getting some needed exercise; running around with the kids and having a tug-of-war contest. I want to take a moment and thank you for the numerous prayers and support that has been given for the Tohoku churches and the Tohoku people in regards to the earthquake and tsunami. The disaster stricken churches are gradually gaining the strength to overcame this trial and are being encouraged towards restoration. Yet, among the damaged places, even if they try to rebuild there is no one to work and so a number of churches are in the position of holding worship in damaged buildings. And the danger and instability of the buildings is only compounded by the continuing level 4 and 5 aftershocks. I would appreciate if you would pray for repairs to be made as soon as possible but more than anything pray that the protective hand of the Almighty be over them. Although they are in this state of disrepair, they daily bring glory to the name of the Lord by bringing relief and restoration to those in nearby evacuation shelters who have evacuated because of tsunami damage as well as the nuclear accident. Please remember to pray for the protection and blessing over these ministries and at the same time please encourage people to volunteer and come to the disaster areas to help. We need many to help in the affected areas. Please do all that you can. Thank you all for your prayers and loving support. On Sunday the 3rd starting at 3pm I and 9 members from our church went to Kawamata-machi in Fukushima prefecture to hold worship at an evacuation shelter which was originally an elementary school. At the moment it is the evacuation shelter for a large number of people from the Futaba area which fell within the 10 kilometer mandatory evacuation zone stemming from the radiation leak. One of our church members had a friend from their high school days in that shelter and that friend is an employee of Tepco and was working at the nuclear power plant. After the nuclear accident, that person decided to evacuate, and one day came to Sendai to visit our church member, who in turn invited them to our Wednesday night prayer meeting were subsequently they were touched by God, believed, and were saved. That person returned to the evacuation shelter witnessing to all about the joy, thanks, and hope of salvation and pleaded with us to came and hold worship at the shelter. So thats what we decided to do. We held the service on an embankment on the grounds of the shelter and had 4 people show up to worship with our church members. They earnestly listened as we prayed and worshiped, had testimonies, a special solo and a sermon. With the result that the man who had been saved at our prayer meeting decided that he wanted to be baptized and another lady declared, “I want to start reading the Bible and going to church.” It is needless to say that we passed out the Bibles that we had brought with us. Finally, we laid hands on each attendee and prayed that they would be able to persevere through this time with the Lord’s protection, faith, hope and love. Please pray that the hand of protection would be over these who have been forced into an evacuation lifestyle by the nuclear accident, and pray that they can quickly return to their homes and rebuild their lives. I would also appreciate if you pray that works of salvation would continue amid their evacuation life. All the glory belongs to the Lord. CNN posted the following article on the current situation at the Fukushima Nuclear Plant reactors in Japan. Reactor 1 is stable and temperatures are dropping. Reactor 2 is still leaking radioactive water in the Pacific Ocean while other conditions are stable. Reactor 3 is stable but will be put out of service due to the fact that it was the source of a plutonium leak. Reactor 4 was offline when the earthquake occurred but has had problems with the cooling pond of spent nuclear fuel. There have been repeated efforts to pour water onto the structure. Reactors 5 and 6 were offline and are in "cold shutdown." Please continue to pray for the workers there to stabilize the reactors completely. They need God's supernatural wisdom and intervention.